It’s a chant familiar during the National Catholic Youth Conference (NCYC), but not one typically heard within the confines of a church. But it’s how Father Patrick Beidelman, executive director of the archdiocesan Office of Worship and Evangelization, helped the more than 1,100 youths from across central and southern Indiana kick off the opening of NCYC after Mass at St. John the Evangelist Church in Indianapolis. And so after the calling of the chant—the right side of the church calling out “NC!” followed by the left side responding with “YC!”—the 1,100 youths, chaperones and parents then reverently knelt as the Blessed Sacrament was placed in a monstrance and incensed before being processed across the street to the Indiana Convention Center. The chanting and procession were the culmination of a special Mass for archdiocesan NCYC participants celebrated at St. John on Nov. 16. The Mass was concelebrated by Archbishop Charles C. Thompson and 17 priests of the archdiocese in the afternoon prior to the first general session of NCYC. He then spoke of wisdom, referring to the day’s first reading from the Book of Wisdom. He noted that true wisdom does not follow the wisdom of the world. Archbishop Thompson outlined six ways to embrace true wisdom: by employing faith, trust, hope, confidence, love and a Christian attitude. “This weekend, let us allow the truth of God to permeate our hearts as we witness those six ways. … [Then] we can achieve what Pope Francis calls for: to continue to cultivate a culture of encounter, of accompaniment. 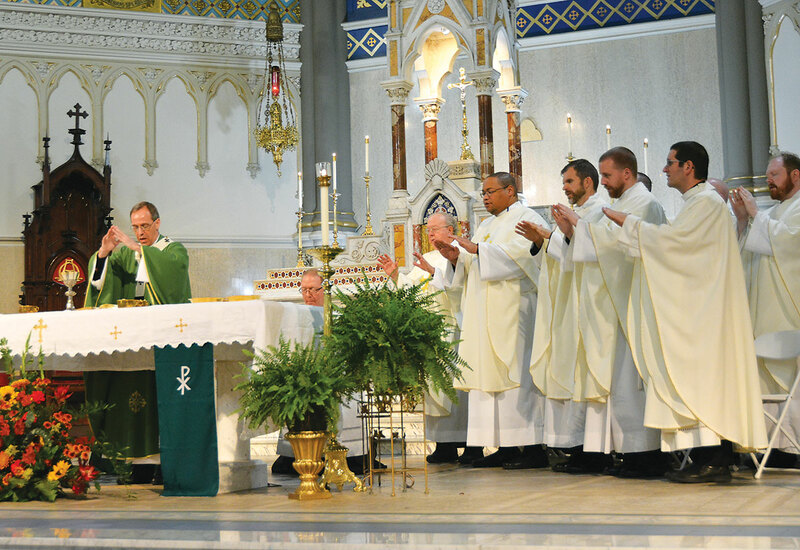 The opening Mass set the right tone for the conference, said Stephen Darda, a youth from St. Luke the Evangelist Parish in Indianapolis. And as for the chanting?